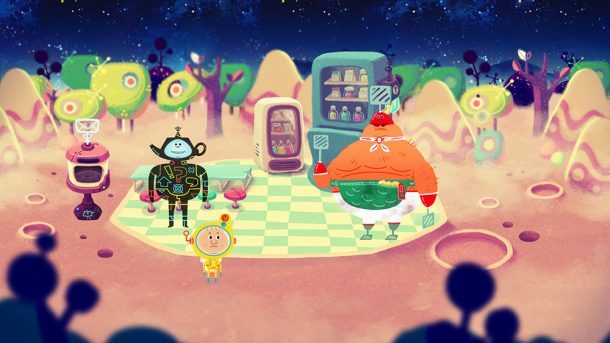 That definition is right on point with Loot Rascals, the latest game from ex-Hohokum dev Ricky Haggett and his Hollow Ponds studio. From the moment my eyes caught the screen tucked away at Sony’s ginormous booth at E3 2016, they couldn’t look away. I was smiling, giggling, and muttering “how cool!” to myself under my breath. I don’t know if I’m supposed to be acting like this in the middle of one of gaming’s biggest show floors, but I couldn’t contain myself. 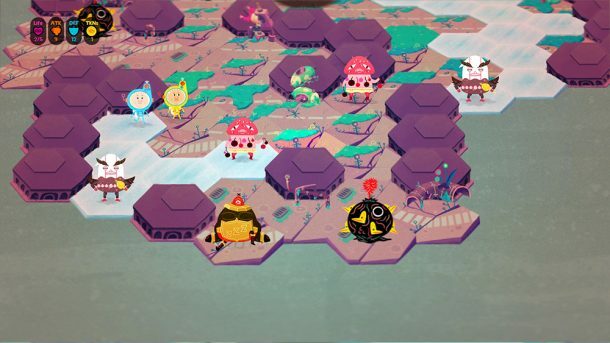 This game is absolutely adorable — and also diabolical. 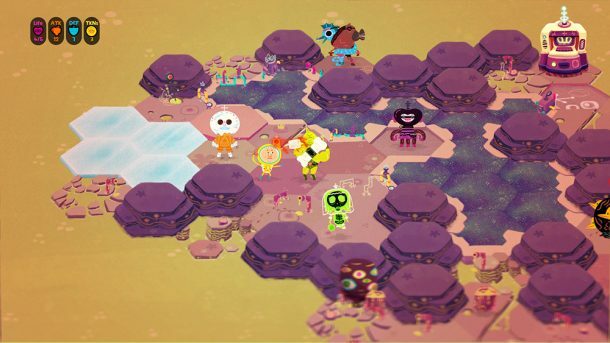 Loot Rascals is a procedurally generated roguelike set in a silly space world filled with bizarre robots and aliens. With monster names like “Disgusting Doris” and a navigator who seems to consistently leave our hero hanging out to dry, it oozes goofy charm. Heck, the hero can find pairs of trousers named “space shorts” that have antennas on them, because space. It is impossible not to grin. The aesthetics aren’t just a glossy coat, either. Thanks to famed artist David Ferguson (who’s worked on games, animated shorts, and Adventure Time) the team was able to bake in the thematic direction from the start. During a conversation at the show, Haggett explained to me that the group made sort of a mood board for what they wanted the game to feel like, filling a Google Drive folder with images of science fiction from the Seventies & Eighties, weird Japanese toys, and even He-Man. Ferguson mashed up the concepts together, sketching hundreds of ideas and ultimately settling on a sort of flat paper retro look that still feels fresh and modern. Though found in animation, not a lot of people are doing a similar art style in gaming, and so the project can stand out against ultra-realism and pixel art. And what better way than with a plot and a game mechanic that is as equally as thoughtful as the aesthetic. The game centers on a loot-hunting astronaut, crash landing on a planet after an evil force apprehends control of his ship. It’s as classic a sci-fi story as can be, but still feels fresh. In order to survive and escape the planet, our little yellow-suited adventurer moves around a hex board, taking turns either battling robots and aliens or dying. Miserably. 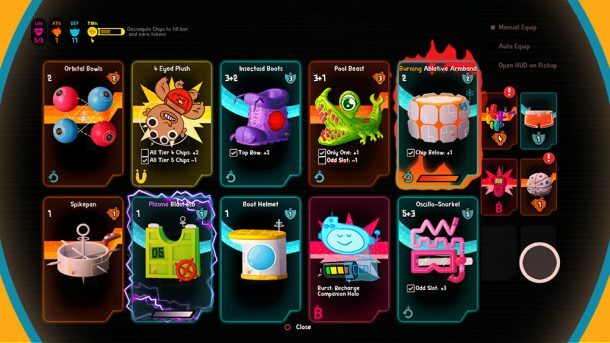 Defeating the aliens earns dropped loot, cards that can increase stats or cause special effects to take place. The game is thus split into these two levels of strategy, causing long-term planning for what may end up being short-term gain. The movement, though adhering to the hex pattern layout, is actually somewhat open. During our turns we’re able to move around freely on the board within our hex and onto others, selecting the best positioning possible and often thinking two or three moves ahead. If we stray too close to the edge, we’re subtly guided back towards the interior of a hex. One of the team’s challenges has been figuring out the analog stick/tile movement. Though they want to give players the ability to move anywhere, a la Diablo, users were learning to take advantage of the tile layout and slide along tile dividing lines, so that the hex wouldn’t register until a full stop. Which tiles did players visit? Where should the defining line be? This is when the team decided to add a sort of parabolic curve to motion, pushing the players away from the edges without inhibiting movement. The board has a day/night cycle, and as players move the enemies on the board will flip between offense and defense. Attacking a defensively aligned enemy will yield less of a chance of counterattack. It’s kind of a dance through the hex board; do I move around an enemy until night, avoid them, or attack them head on? Our actions determine if we will get loot or not, and if we die nearby enemies can loot us of our items. The loot we attain is in the form of cards. These cards, giving either offensive or defensive statistical boosts, are kept in inventory and arranged on a two-row board. As we arrange the cards we need to be aware of where we place them — on what row, next to what other cards – since many of them have modifiers for cards around them. The card concept starts off simple, but the more we play and the more cards we collect, arranging them becomes an entirely separate game. For instance, some cards are great on their own, but damage the stats of those around them. Do I keep a specific card and affect my character stats now, or wait until a turn further down the line and put it off in my holding zone (we have space off to the side for a few cards to be placed on hold)? Will I miss a card because I no longer have space, or will the card I saved end up screwing me in the end? Cards we don’t use can’t be thrown away. Rather, they become “decompiled” into tokens when can be used for various effects, healing and special moves. If we’re in a tight situation and low on health, we may need to burn a fairly valuable card just to stay alive. The cards create an organic way to customize and improve our hero. The developers used to have a more traditional skill tree, Haggett says, but that became almost too linear. The cards allow for more flow, and variation, with a unique experience each playthrough. All of this leads to an interesting mechanism within Loot Rascals related to its asymmetric gameplay. Upon death our cards are looted by enemies and sent to the server. They become attached to an elite enemy in someone else’s game, and if that person defeats the enemy they can either keep the card or send it back to us. How nice! Maybe. Though the game starts off by picking random strangers online, once we interact enough with the people (sending cards back and forth) they will appear more often. This strengthens that relationship in the database, and can lead to interesting back-and-forth of cards. But there are also consequences. Every player has an A.I. controlled hologram that can appear in other players’ games. Interacting with one can be a positive or a negative. If we’ve helped the person, for instance, they may lend us their hologram to be a partner and attack enemies at our side until their “battery” drains. If we’re assholes and opt not to help them, stealing cards without ever lending a hand, they may choose to brutally attack us instead. Underneath a gorgeous exterior and enjoyable, accessible gameplay, Loot Rascals has the ability to become quite devious. The game itself may be genial in nature, but it might require the players to turn up their own charm just to survive. Loot Rascals arrives on PS4 and PC in early 2017.